FREMANTLE has received a massive boost with ruckman Aaron Sandilands free to take his place at the first centre bounce against Greater Western Sydney on Saturday. 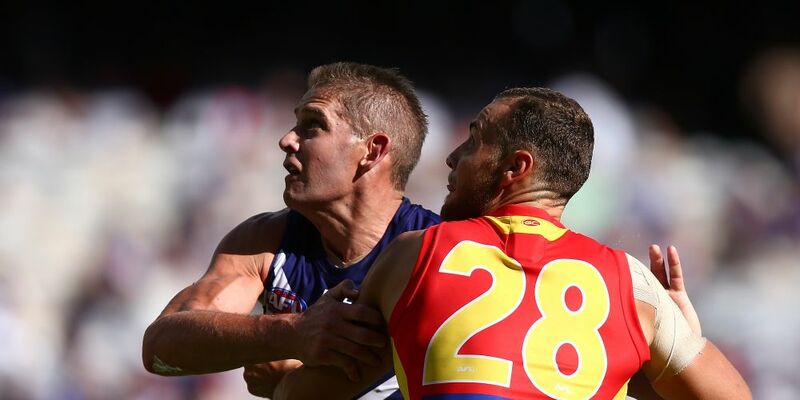 The 211cm giant was charged for engaging in rough conduct against Gold Coast’s Jarryd Lyons during Fremantle’s 28-point win at Optus Stadium on Saturday. The incident occurred in the third quarter of the round three fixture. Sandilands can accept a $2000 sanction with an early plea, meaning he is good to go against the Giants at Manuka Oval where the Dockers will aim for a third straight win. “Based on the available video evidence and a medical report from the Gold Coast Suns Football Club, the incident was assessed as careless conduct with low impact to the head,” the AFL said in a statement. “The incident was classified as a $3000 sanction. Second-gamer Mitch Crowden can also accept a $2000 sanction for engaging in rough conduct against Suns midfielder Aaron Hall during the opening term. The incident was assessed as “intentional conduct with low impact to the body”. Bailey Banfield, who played a starring role restricting Hall to five disposals, was charged with making contact with the 27-year-old while he was recovering from a knock during the first quarter. He can accept a $1000 sanction with an early plea.